Here we have a mixed media work that involves many skills and subjects. 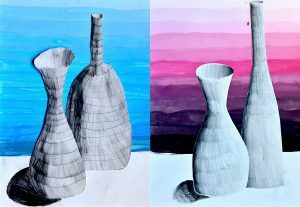 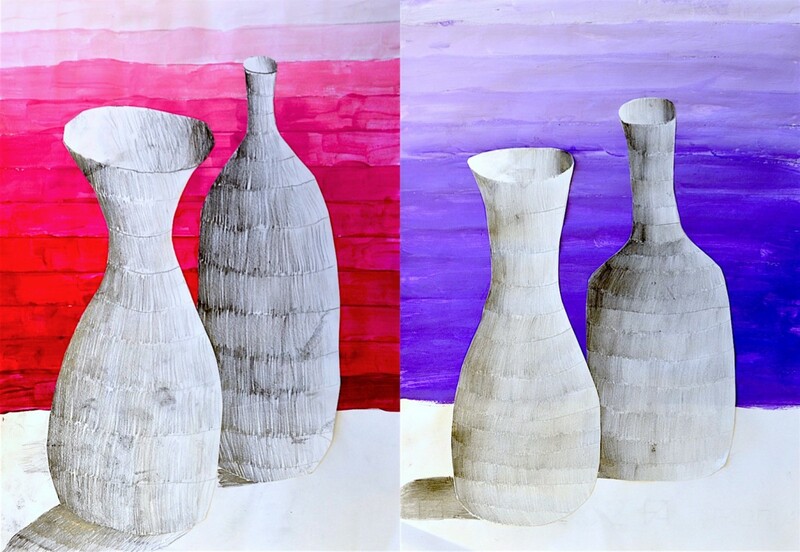 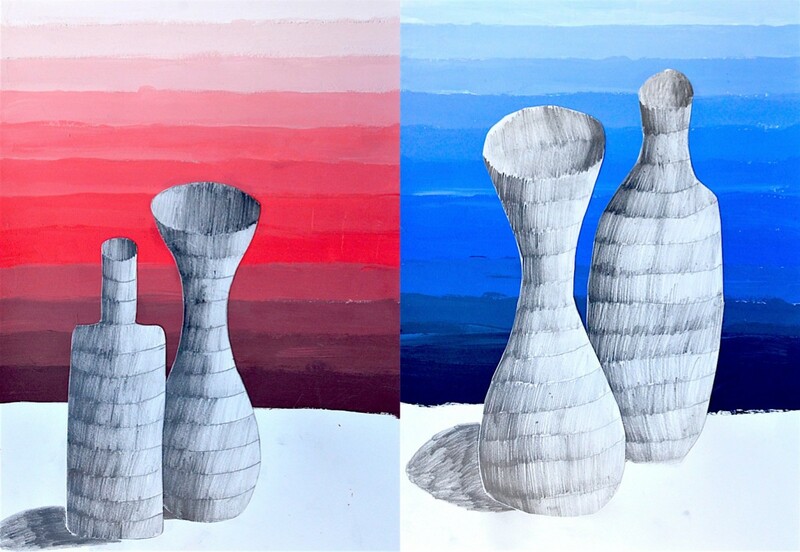 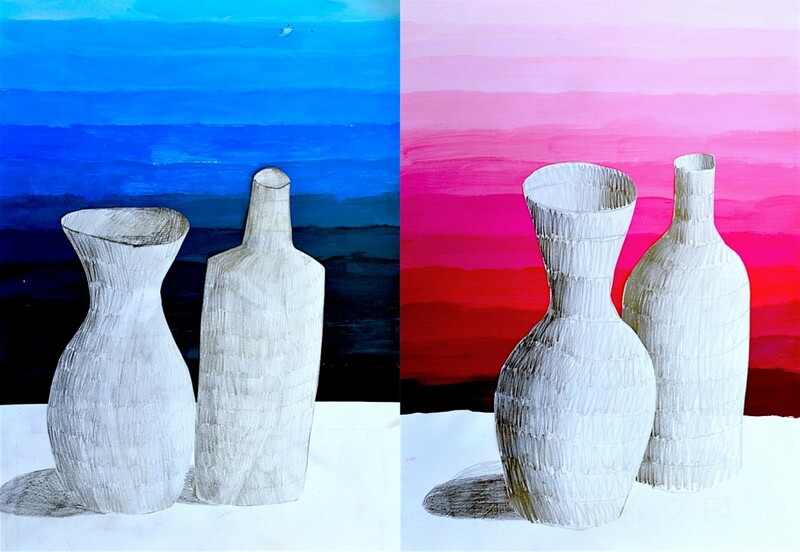 First off all we learn how to paint a tonal gradation with acrylic or tempera painting, in order to create a background for this still life. 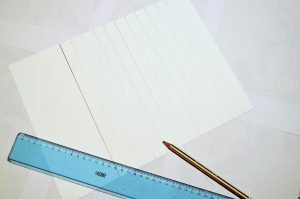 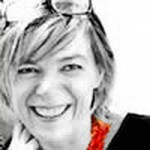 You draw 12 stripes on a drawing sheet (2 centimeter each). 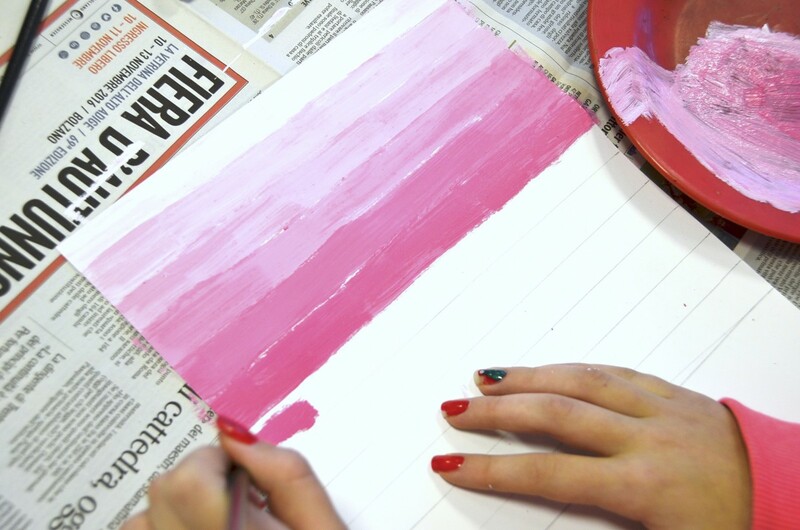 Every line should be painted with a darker tone of the gradation, starting from the lighter one. 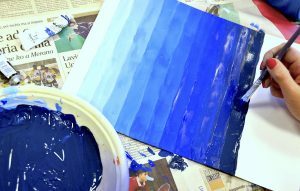 On the palette you prepare three colors: white, a color you like (eg. 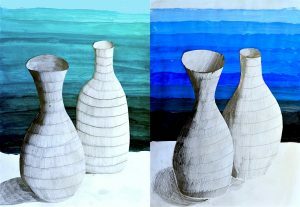 blue) and a little amount of black. 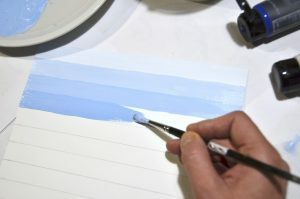 You start with white and you add a very little amount of blue; paint the first line with this color. 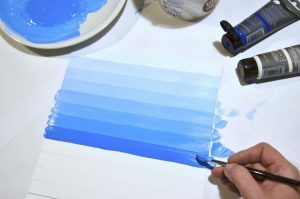 You proceed adding a small amount of blue for every line below and you carry on your tonal gradation until you have only the pure color. In order to proceed with tonal gradations until the twelfth stripe, you need to add small amounts of black to darken the color more and more. 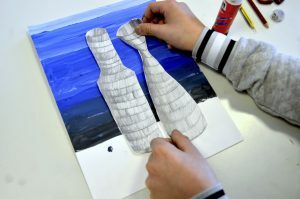 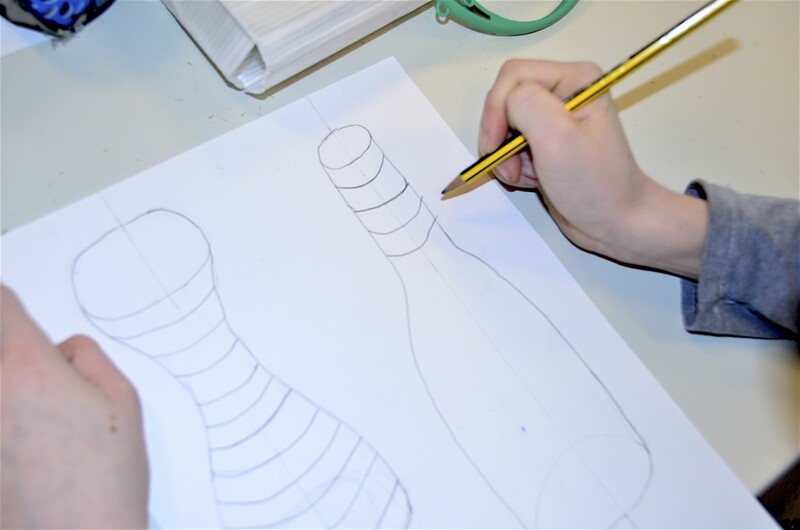 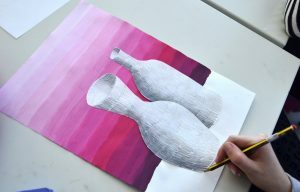 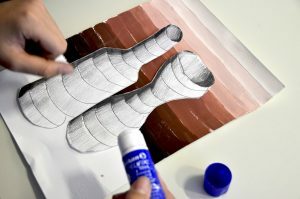 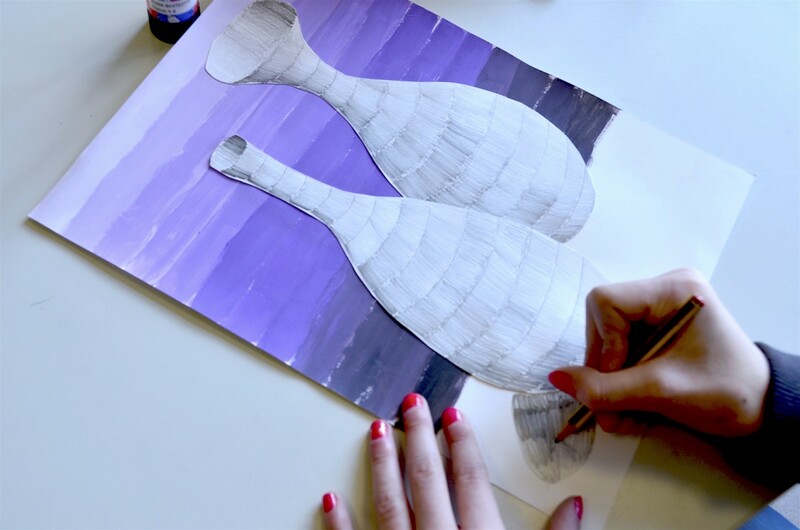 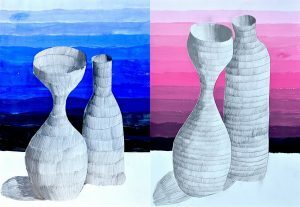 The second task is to draw the objects of the still life with a pencil on another drawing sheet. 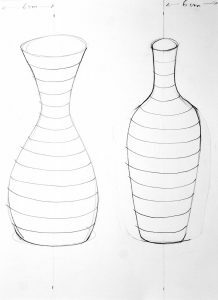 In order to create symmetrical shapes you can draw a line of symmetry for every bottle. 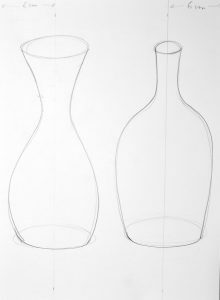 You start with the two ellipses on the top and on the bottom of your vases or bottles: the ellipse must be symmetrically correct. 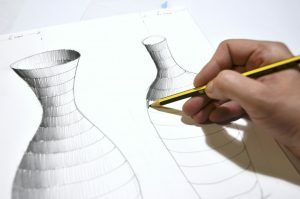 You draw a line from the higher ellipse to the lower: you have drawn half of the bottle. 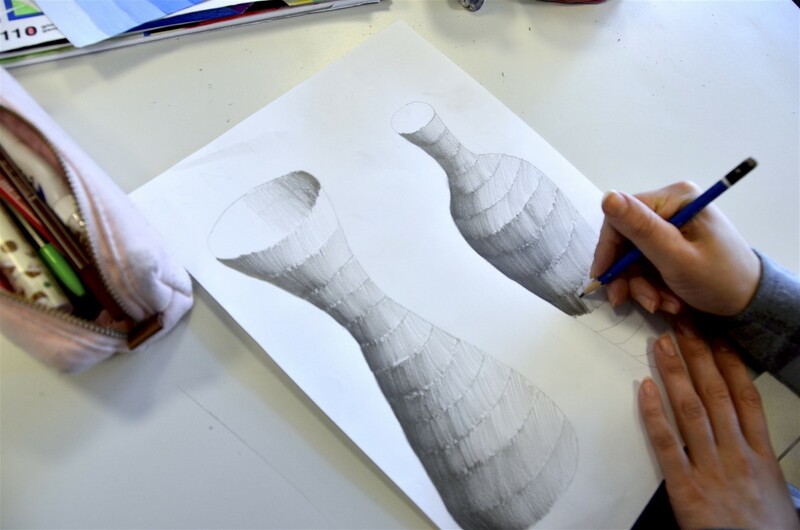 Now you can draw the other half, paying particular attention to the symmetry of the shapes. 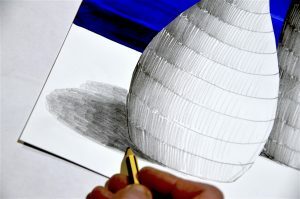 On these object you draw the form shadow with a pencil. 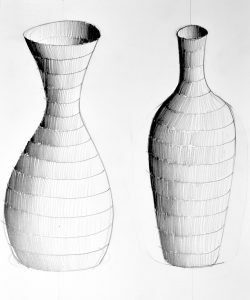 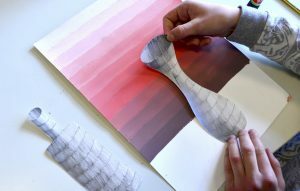 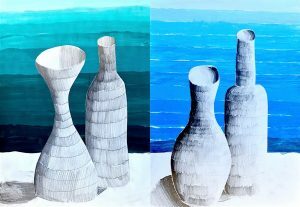 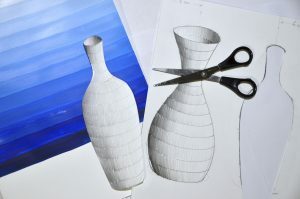 It could help to proceed drawing the shadow in stripes, in order to follow the curved shape of the bottles. 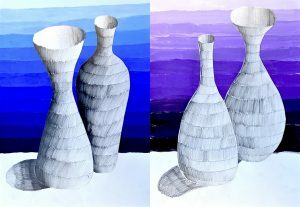 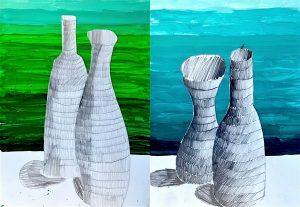 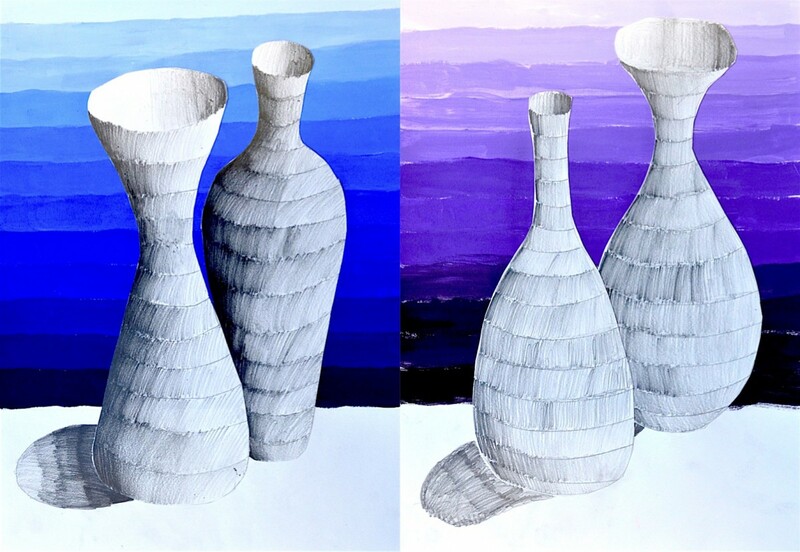 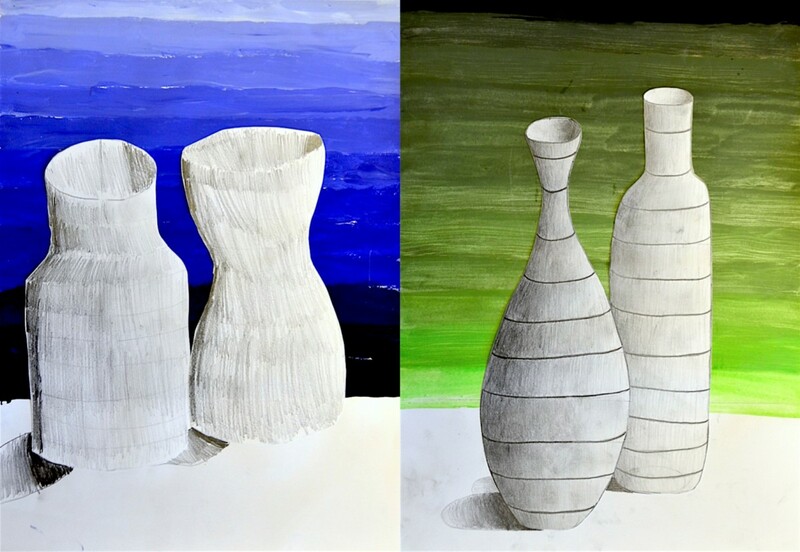 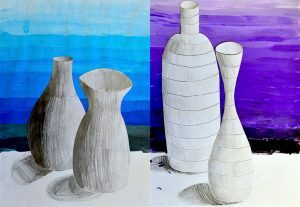 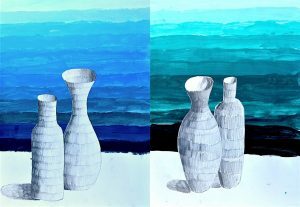 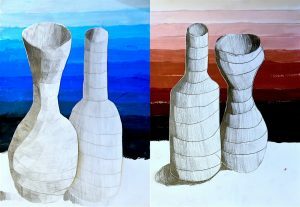 To finish this mixed media work the bottles have to be cut out and glued on the painting with tonal gradations. 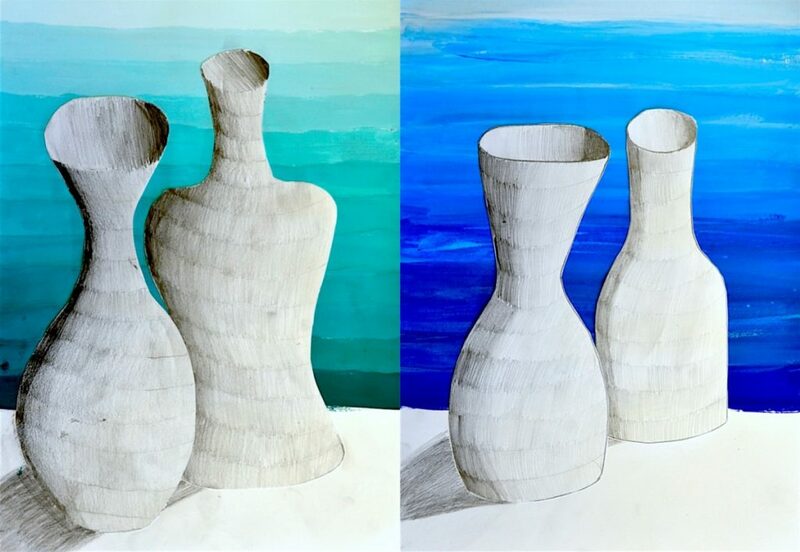 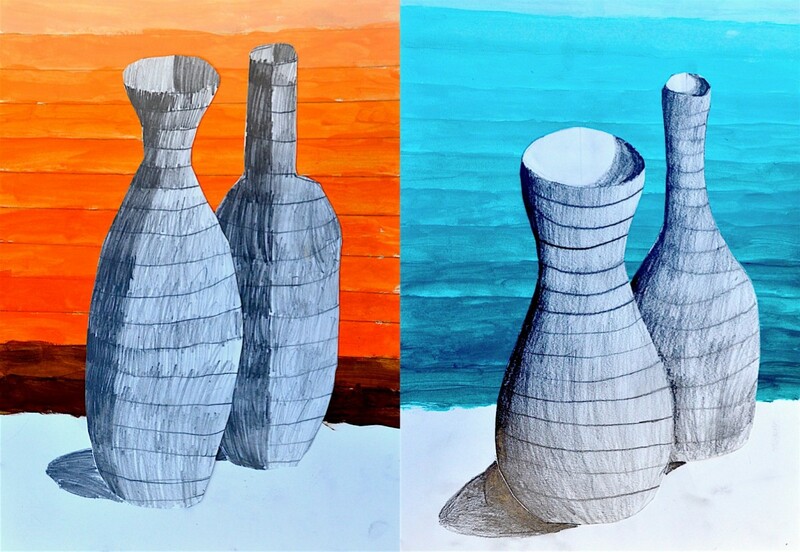 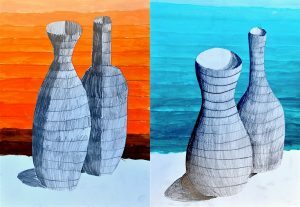 The last step is to draw the cast shadow on the surface where the bottles are placed. 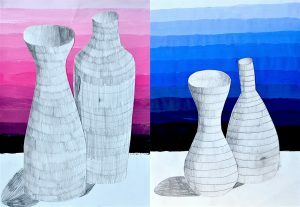 The cast shadow makes the drawing more realistic and gives the sense of depth to the still life.